Its a good idea to protect yourself while working as a race mechanic. It’s a crazy world, things happen and you could get hurt on the job. Likewise, you could be involved in an action that leads to someone else being harmed and possible leads to a lawsuit. With that in mind, its important to be covered. One advantage of a USA Cycling license is accident insurance coverage including medical, dental, accidental death/dismemberment and catastrophic coverage. The accident policy provides secondary coverage for licensed mechanics when they participate in a bicycle event that has been issued a USA Cycling permit or participate in training programs of USA Cycling under the direct supervision of the USA Cycling staff. For more information contact USA Cycling’s Director of Financial Services at 719-578-4581, ext 3292 or head to http://www.usacycling.org/news/user/story.php?id=627. Take note, this is secondary and most likely wont cover all your medical needs. 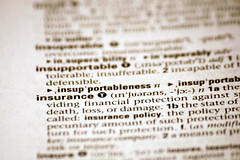 You should consider personal medical insurance coverage and a a liability plan if running your own business. If using your own vehicle during cycling events you’ll also need automobile insurance. USA Cycling’s plan doesn’t cover personally owned automobiles so you are on your own here. Make sure your insurance agent understands how you plan to use your car, truck or motorcycle and provides a plan with appropriate coverage.